South Carolina is a BBQ hotspot. Just look at the billboards promoting the SC BBQ Trail as you travel SC’s major roadways. You can’t help but notice — and be tempted to stop in somewhere and grab a bite. Get your own personal copy of the SC BBQ Trail Map or better yet, just use our more complete, up-to-date, interactive, online SC BBQ Trail Restaurant Finder. So just why did SC decide to promote BBQ of all things? First, South Carolina is arguably the birthplace of BBQ. Like with most things, SC stands proud upon its traditions. Our state boasts several distinct regions wherein BBQ enthusiasts can sample a barbecue that is at once historically unique to that section of the state and, yet, significantly different from what may be served in even a neighboring county. Much of that has to do with the “base” its sauce is built upon. SC is the only state in the union in which four different sauces evolved and stood the test of time: vinegar-pepper, light tomato, heavy tomato, and the sauce that is most unique to SC, a mustard-base. With such a history, it is no wonder that those traveling within South Carolina would be eager to sample all of the various flavors of SCBBQ. 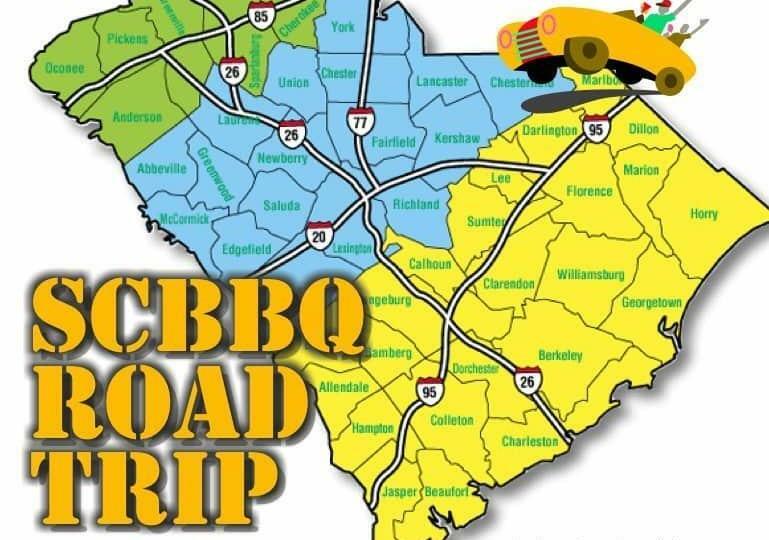 In this series, Destination BBQ takes a look at the BBQ options along each of the major roadways traveled by SC residents and visitors alike. Five interstates crisscross the state, and each passageway provides ample opportunity to get a taste of true SCBBQ. Whether you find yourself passing through the state or simply traveling within it, we will catalog each of the stops along your journey and reveal our Top Three “Must Visit” locations to be found along that particular stretch of highway. Each of these restaurants must lie within 10 miles of an interstate exit. Because this is meant for travelers, time and distance are important factors. If there is an exceptional option just beyond that range, we may include it, with notes of the extra distance. Nothing will be farther than 15 miles from an exit; most are within 5. Several interstates have ending/beginning points in SC. SCBBQ restaurants that aren’t “on” a given interstate have not been included. For instance, I-26 ends in Charleston. There are many BBQ restaurants within 10 miles of the end of I-26, but none of them are included since they aren’t really on I-26, but, rather, beyond the end of it. In a case like Maurice’s, which has more than a dozen locations, there are likely to be many different shops along a given route; we will only identify one, being a representative sample. Know that there may be others nearby, particularly as you pass through Columbia. In a case like Dukes, however, each Dukes is different and unique and — despite what you may assume — they are not all part of one chain, so each will be included. Know that Dukes is not a chain, but distinct and separate restaurants that happen to be loosely connected by family relationships. Inclusion on this list should not necessarily be taken as an endorsement; we haven’t personally tried them all. We will provide links to our page about each where you can learn more and make your own decision. The mileage provided for each restaurant is based on its distance from the interstate exit; however, it is not precise. That said, mileage was calculated using Google maps so it should be very close. Give us a margin of error of about a half mile. Locations may be listed as “Must Visit” because of a significance beyond the actual quality of their BBQ. For instance, they might have played an important role in the history of SC BBQ or be particularly representative of some aspect of BBQ in SC. So, with that framework, we will soon begin our Road Trip series, helping you find your way to both the famous locations and the hidden gems near our major roadways. We highly recommend our SCBBQ Trial Locator Map. It was built for travelers and SCBBQ enthusiasts. With your permission, it will find your location and show you the 25 closest SCBBQ restaurants within 100 miles of you. And, if you like, you can filter the results so that it only shows you certain matches, like those that take cash only or those who serve a mustard sauce. Remember, CALL AHEAD. As we said, most of these are small family-owned restaurants. Most are not open every day of the week, and it would not be unusual — particularly around a holiday — for them to close up shop because they have sold out, are traveling, have an event to cater, or simply have more pressing business that needs to be tended to. There are, of course, many SCBBQ restaurants that are not “on” or even near an interstate. As noted above, we have chosen to exclude these restaurants from our list, but do not fret. Following this series, we will begin another series on the “Must Visit” SCBBQ restaurants within each of our primary geographic regions, but we felt we could best serve those traveling around our state by focusing first on our major roadways, so this is where we begin. We hope this series helps you find just the right place to stop as you make your way around the state. Longtime residents may discover new places and visitors can get a true taste of SCBBQ.